Most people know that in California, if you work over 8 hours in a day or over 40 hours in a week, you get paid overtime. What most people don’t know is that people died for your right to overtime pay. In the late nineteenth century, the working class was in a constant struggle to gain the 8-hour workday. Working conditions were severe and it was quite common to work 10 to 16-hour days in unsafe conditions. As early as the 1860’s, working people fought to shorten the workday without a cut in pay, but it wasn’t until the late 1880’s that organized labor was strong enough to declare the 8-hour workday. Although organized labor declared it, the 8-hour workday wasn’t law until 1938—more than 50 years later. During that time, many people were killed during protests and organized labor strikes while fighting for the 8-hour day. One of the most famous examples of the protests and strikes that turned bloody is the Haymarket Affair, which is commemorated by the celebration of May Day on May 1 of each year. It began in 1886 when a broad coalition of labor organizations launched a nationwide campaign demanding an eight-hour workday. On May 1, the coalition began a general strike throughout the U.S., the effects of which were particularly strong in Chicago. On May 3, violence broke out between strikers and police at the McCormick Harvesting Machine Company in Chicago. Police fired into the crowd, killing two workers. In response, thousands of workers rallied the following day at Chicago’s Haymarket Square to protest the killings. The demonstration began peacefully until an unknown individual hurled a bomb into a group of people, killing seven and wounding 60 others. Police then opened fire on the crowd, injuring dozens. Another famous example is the Pullman Strike in 1894. On May 11, workers at the Pullman Palace Car Company went on strike after their employer cut their wages by 50% while the rent for their company-provided housing stayed the same (all employees were forced to live in Pullman, a company town built near Chicago). Within a month, more than a quarter million unionized workers across the nation had come to the aid of the strikers, boycotting any train carrying a Pullman car. The nonviolent protest was devastating to the railroad industry, which nearly ground to a halt. President Grover Cleveland, facing pressure from railroad executives, won a court injunction ordering the strikers back to work. 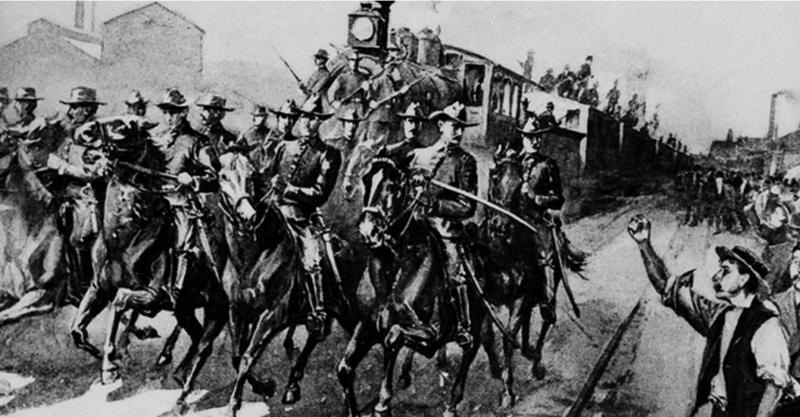 When they refused, President Cleveland dispatched more than 14,000 federal troops and marshals to break the strike, sparking riots, violence and the burning of train cars. In Chicago, soldiers fired into a crowd of 10,000 people, killing 25 people and badly wounding 60. Despite these protests and strikes, the United States government did not recognize your right to an 8-hour workday until President Franklin D. Roosevelt forced the passage of his New Deal, which included the Fair Standards and Labor Act (FLSA), as well as several other crucial developments in the law. Despite passing laws to ensure your right to an 8-hour workday and overtime pay, companies still fail to follow these laws. Collective action is still the best and arguably the only way to stand up to these companies and enforce your right to overtime. If your employer isn’t paying you overtime or is doing it incorrectly, contact CJL to discuss your rights. Illustration: Pullman Strike of 1894, workers subjected to 12hour workdays and decreased wages. Federal troops were called in to break up the strike and violence erupted. Source.